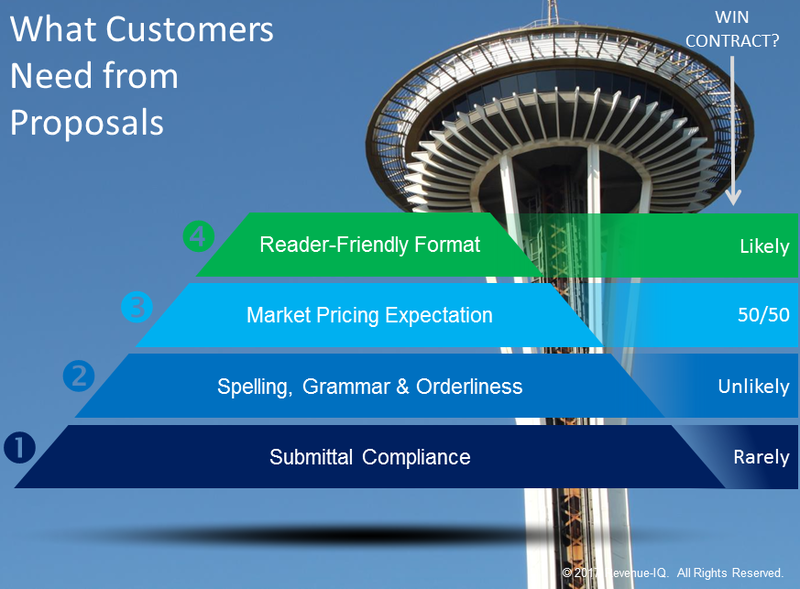 What do customers need from sales proposals? If sales teams had that answer, they’d be as happy as cats in new mown hay fields because win ratios would sky rocket, commissions would be paid in buckets, and managers would approve more time off. The place to begin understanding proposal needs, from the customer’s perspective, would be to start by recognizing they’re human. 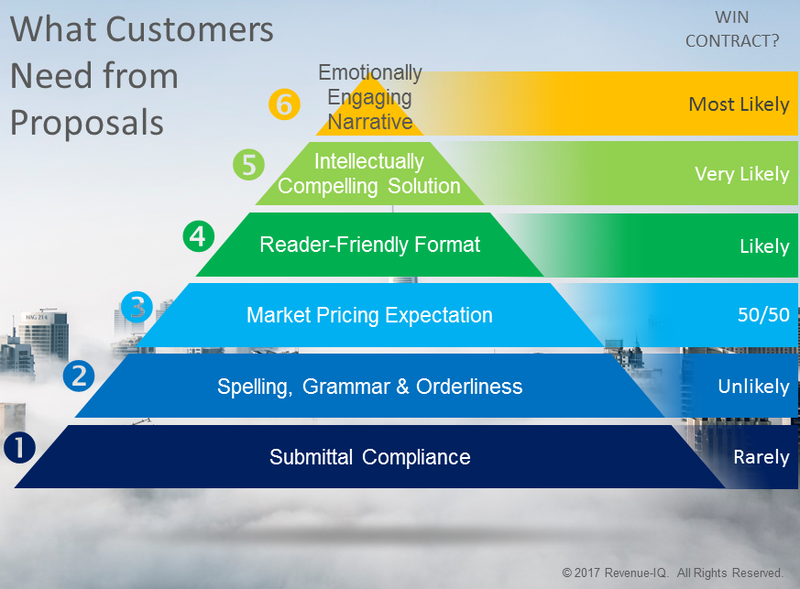 So here’s a take at answering the question “What do customers need from sales proposals.” It’s based on anecdotal evidence and my experience writing proposals as well as evaluating them. And like Maslow’s hierarchy, the lower needs must be fulfilled before the higher ones come into play. 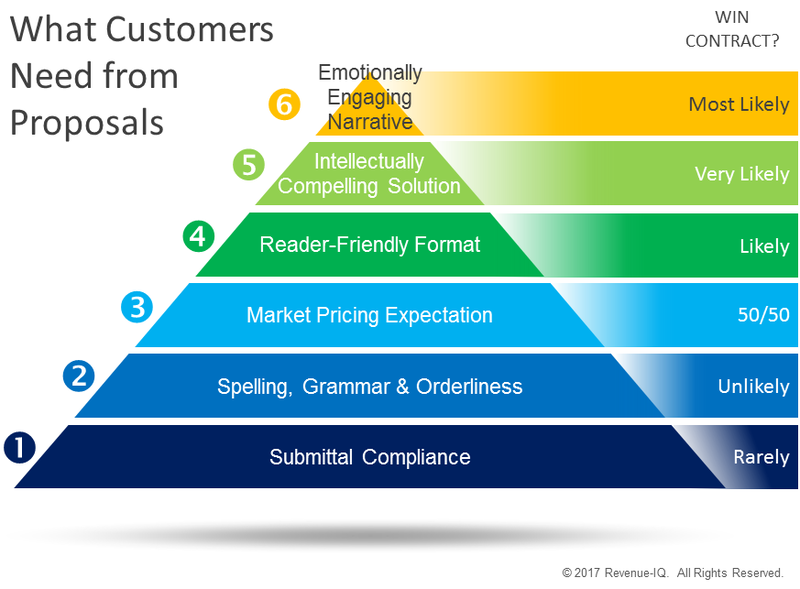 So, as a sales resource, let’s look at proposal needs from a customer’s perspectives. Obviously, if your proposal doesn’t serve this need, then you’re out of the game. Simple, right? NOTE: This isn’t about whether your references are as good as the competition, just that you answered the question with the references you have. Likelihood of Winning Contract if ONLY Meeting This Need? OK, they’re breathing, kick ’em into the next stage. After fulfilling Submittal Compliance, proposals must pass this basic business literacy test. 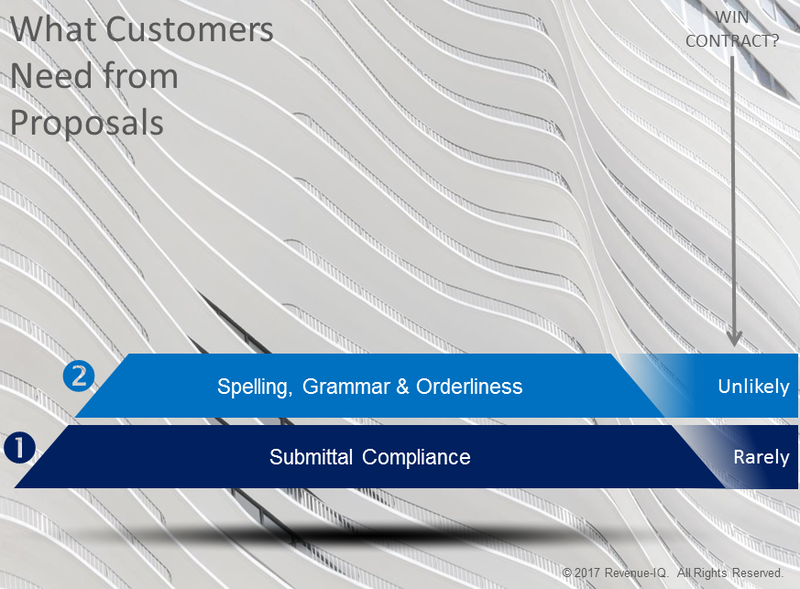 Let’s face it, if your proposal looks as if written by a grade schooler in crayon with misspellings and grammatical errors, customers will see you (and your firm) as incompetent at best, and a child at worst. If they consider your proposal at all, it will only be as their very last, worst choice. Likelihood of Winning Contract if Meeting This AND Lower Need? Well, at least they know how to use spell check, let’s see what’s next. Customers don’t know what the exact price should be for any one individual proposal. 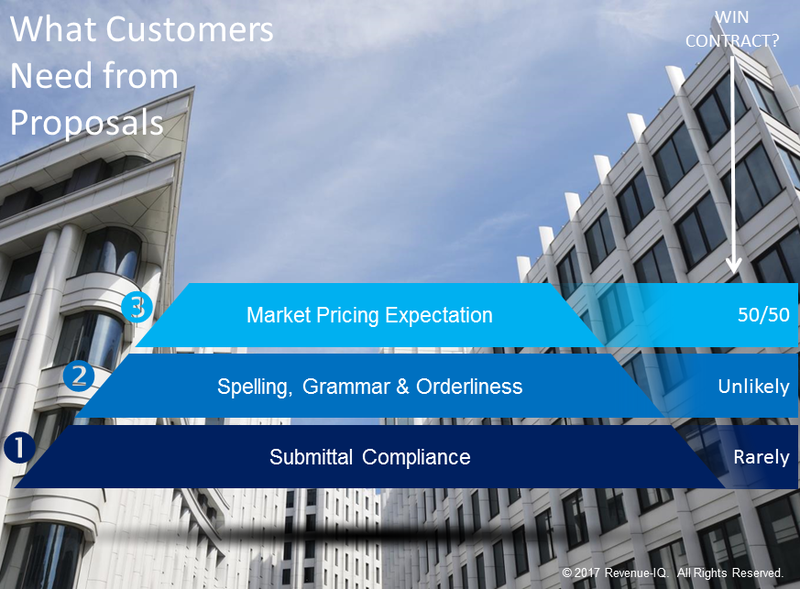 In any bid process with more than three proposals, pricing will be grouped around several proposals, with possible outliers very low and/or high. Customers believe they know what their price’s market range should be. Therefore, for a sales proposal to meet this customer need, pricing must be within their expected range. They can continue their evaluations with only the proposals that are within their expected range AND often, include the low priced outlier as well. 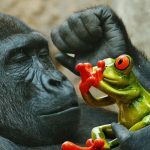 Either way, to meet this need, proposals must avoid being the highest price outlier, and hopefully customers will continue with evaluations into more qualitative areas. Likelihood of Winning Contract if Meeting This AND Lower Needs? 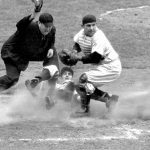 Proposal pricing is in the ballpark — what do we get for that spend? 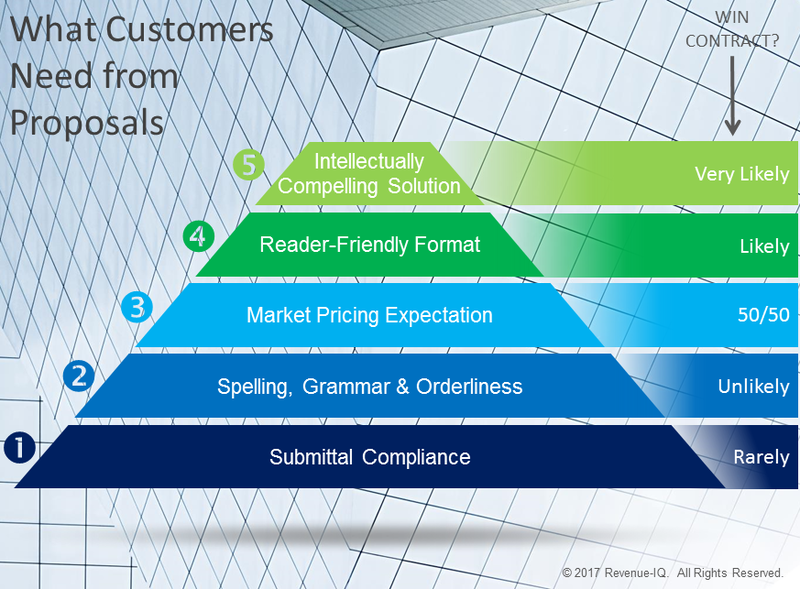 This need is about customers “wanting” to read proposals: They must read the proposal to understand its proposed value. If they don’t read it because it’s ugly or hard to follow, they’re left with price alone to evaluate and select the winning proposal. Hmmmm! 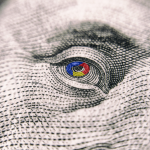 Price alone as sole determinant; that sounds like an informed basis for a good decision. Yes? It’s in the content that proposed solutions are presented; the only place where customers can see the value to be received for the investment made. Pricing alone doesn’t do it. That’s why it’s important for the proposal to be visually attractive; an invitation to read it. Customers have a limited amount of time, maybe limited interest too, to read through three to six proposals at maybe 100-200 pages per proposal. They don’t read proposals, they haven’t the time (remember they have day jobs to do). So they skim proposals at 700 words per minute vs. reading at 200-220 words per minute. They’re trying to blow through tons of information so they can rate suppliers’ responses, solutions and/or capabilities (typically procurement has weighted the questions at the start). For this need to be met, proposals must look more like a USA Today newspaper than an accounting textbook. Headings, bullets, tables, charts and images (never clipart) make proposals attractive and navigable to skim or read. Great looking, easy read — Interesting, so that’s what they’re doing different than the others! When customers are invited to read proposal text (because it’s visually attractive), its content must hold its own. 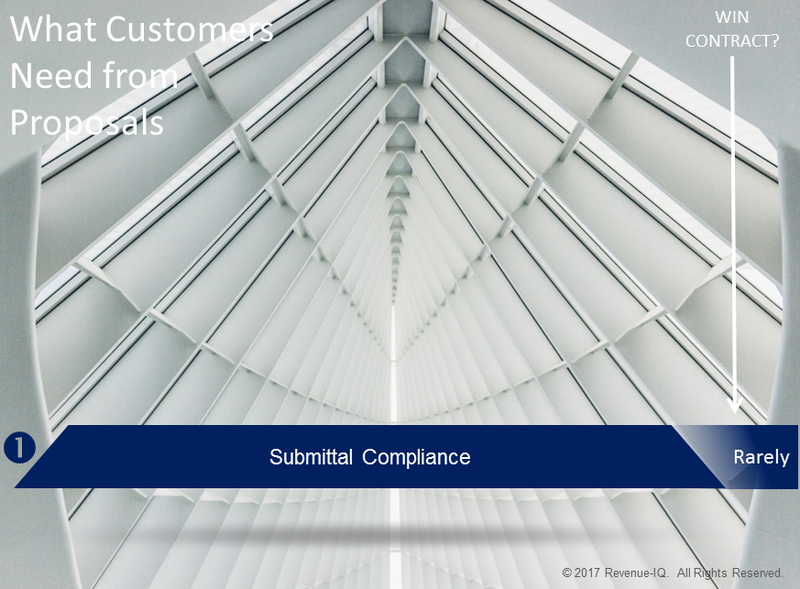 This need requires proposals to have a compelling, cohesive solution to customers’ specific situations; their industry, enterprise, department, staff capabilities, etc. They need to see how that solution directly solves their unique problems and helps them work better, faster, cheaper. This means the solution must be intelligent, well planned and demonstrate suppliers’ technical expertise. Importantly, customers need to see a holistic solution, one that addresses their entire situation and multiple needs. This is true even when customers’ RFPs have questions about individual components isolated from an integrated, holistic solution. For example, customer RFPs often ask separately about hiring, training, and back-office capabilities without asking how they all might work together for them. Lastly, this need requires proposals to demonstrate suppliers’ understanding of how that customer works; their dress code, values, communication preferences, expectations, etc. 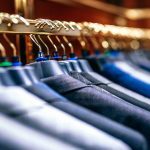 Customers don’t want to mistakenly hire a supplier who stands out like a tuxedoed butler in a cowboy honky tonk. In Maslow’s hierarchy of needs, humans, after mastering all lower needs, seek to self-actualize, to realize their full potential. It’s the desire to accomplish everything that one can, to become the most that one can be. The same is true for customers: They seek suppliers that articulate the customer’s higher vision and show how they help them achieve it. 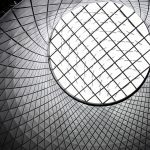 Customers seek proposals that bring to life a breath-taking, aspirational, yet attainable future. Rightly or wrongly, customers, because they’re the buyer, can feel superior to suppliers. That suppliers are lesser beings who aren’t as advanced, dynamic, or exciting as they are. But when a supplier catches customers’ imagination with emotionally engaging narratives, it flips that customer assumption. Now it’s the customer who aspires to be like the supplier; they want to be seen as advanced, dynamic, and exciting as the supplier.